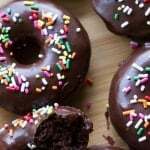 Super moist & fudgy, this easy recipe for baked chocolate doughnuts with chocolate glaze is a chocolate lover’s dream! These double chocolate donuts are way better than the ones from the bakery, and there’s no deep frying. 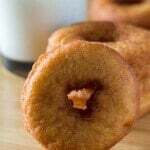 Have you ever made doughnuts at home? Today we’re making baked chocolate doughnuts that are dipped in chocolate glaze. They’re perfect for true chocolate lovers – and super easy to make since there’s no deep frying. Since it’s almost the weekend and it’s also the 2 month anniversary of Just So Tasty (maybe not a huge accomplishment – but I like small wins) – I decided to celebrate by making doughnuts. Double chocolate doughnuts in fact. 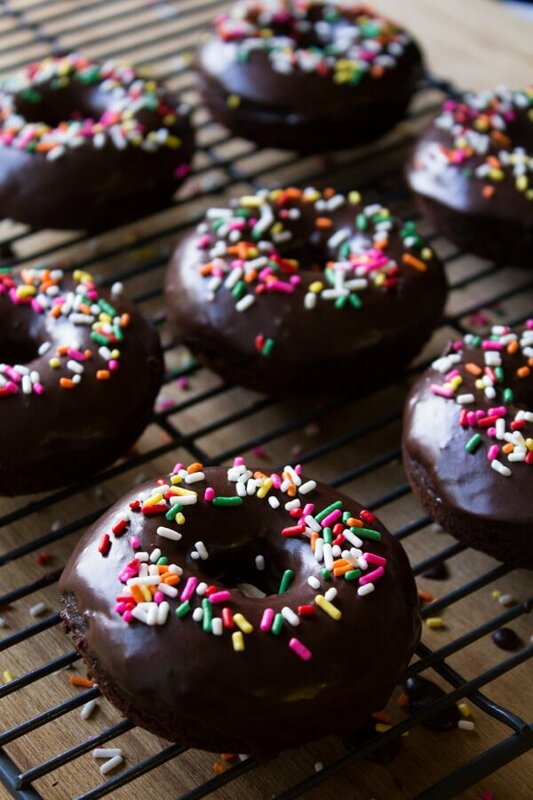 Super chocolatey without being too rich, nice and moist with that perfect doughnut texture, dipped in chocolate glaze and showered with sprinkles – the only thing that could make these doughnuts better would be a unicorn. 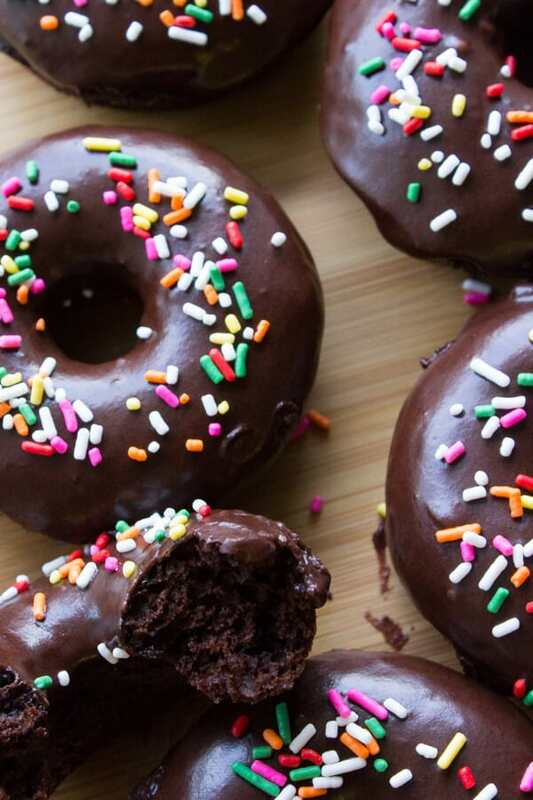 But seriously – these baked chocolate doughnuts are awesome. They’re absolutely delicious, super easy to make and there’s no deep frying. It turns out that the most popular recipe on my blog so far has been my Soft-Batch Double Chocolate Cookies. So I figured I’d celebrate the almost weekend with another chocolate lovers recipe. And do a little deja-vu from my first post ever – Baked Vanilla Cake Doughnuts with Chocolate Glaze. So – Baked Double Chocolate Doughnuts it is! These doughnuts are of the cake variety and baked in a doughnut pan. You make the batter by simply combining the dry ingredients and then whisking together the wet ingredients in a separate bowl. Then – add the dry to the wet & whisk until combined. That’s right – no mixer! And the batter comes together in about 10 minutes flat. Really and truly the hardest part is getting the batter into the tin. You can spoon it in, but I like to use a large ziplock bag. Simply pour the batter into your bag and cut one of the bottom corners off. You can then use the bag to pipe the batter into your tin. 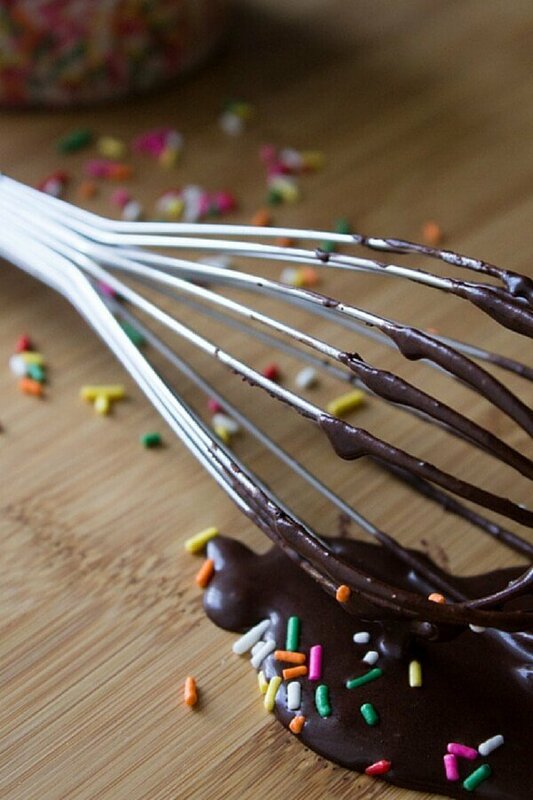 This makes for way less mess and much less spilling of batter. The chocolate glaze is really the final touch of deliciousness. A little cream, icing sugar, cocoa and corn syrup whisked together and you’re done. The corn syrup gives your glaze a nice little shine – your doughnuts belong in a bakery case. And taste better might I add. How’re you celebrating Thursday? I hope with some chocolate doughnuts! 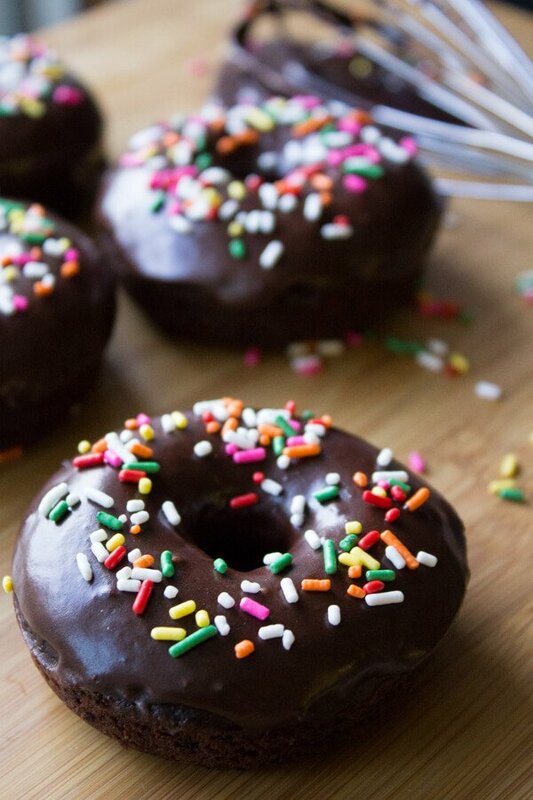 Double Chocolate Doughnuts. 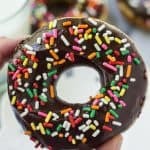 Super moist & fudgy, this easy recipe for baked chocolate doughnuts with chocolate glaze is a chocolate lover's dream! Preheat the oven to 350F degrees. Spray a 6 cavity doughnut pan with non-stick cooking spray. In a medium bowl whisk together the flour, cocoa, baking soda and salt. In a separate medium bowl whisk together the melted butter, egg, sugars, vanilla & buttermilk. Add the dry ingredients into the wet & whisk until combined. The batter will be thick. Spoon the batter into the prepared doughnut pan. Or pour the batter into a ziplock bag, cut off the bottom corner, and pipe the batter into the prepared tin. Bake for 8-10 minutes. If you lightly touch the doughnut, it should spring back. Or an inserted toothpick should come out clean. While the doughnuts are cooling, make the glaze. Whisk together the icing sugar, cocoa and about 2 tablespoons cream. Add the corn syrup and slowly add the remaining cream until the glaze is smooth. Once the doughnuts are cooled, dip the top in the glaze and sprinkle with sprinkles. Looking for More Delicious Baked Doughnut Recipes? Baked Mocha Doughnuts for all the coffee lovers out there. 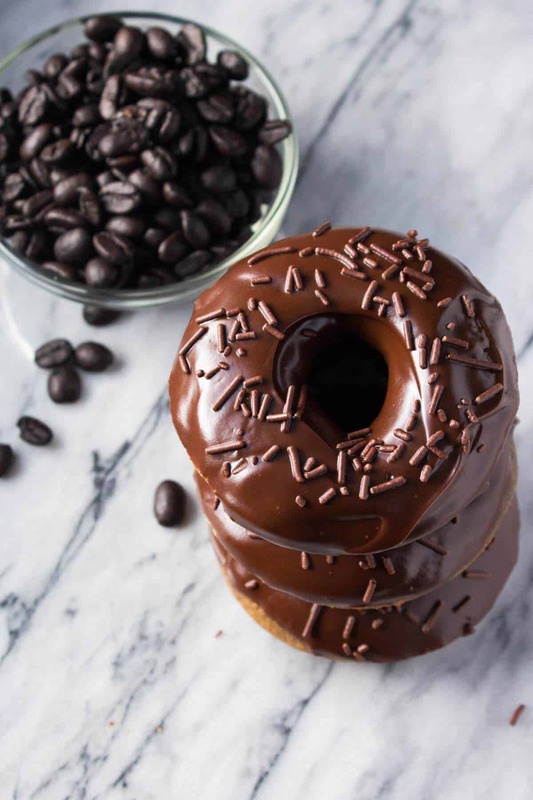 These are delicious coffeee-flavored baked doughnuts that are dipped in fudgy chocolate glaze. Get the Recipe. I just made these and haven’t tried them yet. I don’t know how much longer I can wait….but the glaze is still wet. I did add some butter (about a tablespoon or so) to the glaze because it was runny and too sweet. The butter made it a little thicker and even more delicious. They are beautiful and I will be making them again! By the way, I got 8 big donuts out of the recipe. Yum! 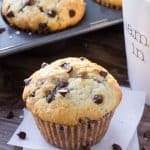 If I didn’t want to use the cocoa powder for the glaze, how would you suggest scaling back the rest of the ingredients? Or do you have another recipe for a white glaze/icing? You could try using the cream cheese glaze from this recipe: or just replace the cocoa powder with more powdered sugar for a vanilla glaze. These donuts look absolutely amazing! I want to make them for my mothers birthday. I haven’t made them yet but I definitely will! I was wondering what cream I should use for the glaze, like heavy cream or half and half or anything else?